What can be more exciting than setting a cocktail on fire for the delight and amusement of your guests? I mean a great cocktail is a thing of beauty, but a great cocktail on fire! That is something truly entertaining. Before I go any further, the Ealoli Lawyers inform me I have to remind you that mixing fire and the home bar is not something to take lightly. 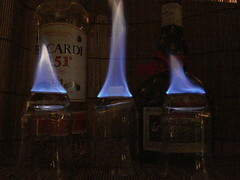 Igniting alcohol is a dangerous thing and precautions should be taken. Know where your fire extinguisher is and know how to properly put out an alcohol fire. And that would be a wet towel for those of you scratching your head right about know. And if you think this isn't serious buiness, search "flaming drinks gone wrong" on youTube. This one is my favorite. The Ealoli lawyers informed me that I must remind you not to stick your fingers into a pool of alcohol that is one fire as I did in that video. I don't mind, but they get nervous easily. Where was I? Oh yeah, getting fire into your glass. Well, first you need a cocktail. Then you need something to hold the flame. Then you need a match. The cocktail, that should be easy. Something to hold the flame. Unless you happen to have a vessel designed for fire, this is not so easy because you really shouldn't just pour some overproof rum on your drink. You can, but there are better ways to do it. Matt Maranian in his book Pad suggests using a lime or lemon shell with a crouton safely skewered inside. That works really well, except the crouton is inedible and tends to smell bad as the flame uses up the alcohol. What works better is a sugar cube, and if you don't burn it too bad is still edible. Lastly, you need a match. Or lighter. Or two sticks and some string. Or super-human powers with the ability to summon fire on command. Oh, the Lawyers are on about something, but the duct tape is making it hard to understand what they are saying. If you would like to see the whole process of the drink and fire, check out This video from Don at Experiment33. And, keep an eye out for the ceiling fans. OK, so now I have an idea how to ignite my cocktail, how do I get a picture of said cocktail? 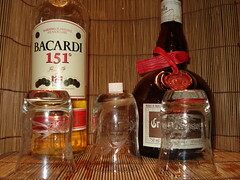 The first two glasses are holding Bacardi 151, the third is Grand Marnier (which is a bit expensive to burn like this, but it smells so good). The second glass has a sugar cube added to show the flame better. It acts as a wick to lift the flame and the sugar burning adds some nice color to the flame. Thank you for that, but I know I only have about six people who read regularly (thanks Mom!). Well, January is Mardi Gras Season and this year it was a short season. Damn that Lunar calendar thing..... This year our Krewe managed to pull off a Masked Ball and Luau, the creation of an eight foot tall Moai for the parade, costumes, beads, and then win an award for it. Check out the Krewe Kon-Tiki blog to see what kind of chaos and mayhem we've been up to. Here is a link to my Flick'r pool if you want to see more. I managed to snag a bit part in a friends video project, Tails of the Merman. It is a five part serial and we are about to finish filming the fifth installment. I'll keep you updated as it gets closer to broadcast.